Picture this: me at Cost Plus World Market. Overwhelmed by holiday ornaments, decorations, special holiday brews and bubblies placed out. I’m there simply to find cool jars to put lemon curd in that I’m making as holiday treats. Right. As if that was possible. Focus, Craig. FOCUS! Two Christmas ornaments for friends, two kitchen rug mats, 7 jars with clamps and gaskets, and one broken jar (oops…it jumped off the shelf when I looked at it I swear!) later, I ran across the infamous Italian panetonne. Immediately I flashed back to the years when my family lived in Naples, Italy. We would get countless numbers of these holiday cakey bread things from neighbors, having it in our hotel rooms during a Christmas to Rome in the “mini” size. Or it least it seemed like countless numbers. They all were convinced that they were giving us the ultimate treat ever. And in some ways, they were. They gave us a part of their culture, liking us enough to say “here…we want you know who we are”, and memories that I have until this day. But have you eaten one?? Has anyone actually tried to choke a wedge of one of these things down dry? (Prosecco does help.) I guess the first one you eat probably isn’t all that bad, but after 5, 6…20 of them THEY ARE NOT ENJOYABLE AND THERE IS NOT ENOUGH PROSECCO IN ALL OF ITALY. Not to mention the sugar induced diabetic coma. But perhaps I had heard of something one could do to make them enjoyable. 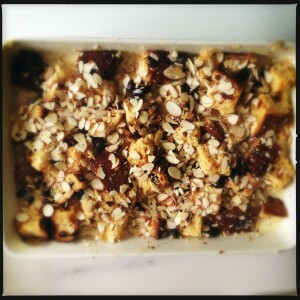 Yes, my friends … I’m talking PANETTONE BREAD PUDDING! Cubed panettone, ready to be toasted. The word “panettone” derives from the Italian word “panetto”, a small loaf cake. The augmentative Italian suffix “-one” (pronounced “o-neh”) changes the meaning to “large cake”. Maybe I wasn’t so far off. Anyway, it is a dessert cake that has a slightly almond flavor and has raisins and dried fruit in it. It always come in that box with the same trapezoidal type shape with a little ribbon handle at the top. Gotta love em, even if you hate them. I decided I would conquer my fear of them from childhood and remake it into bread pudding. I wasn’t too concerned as I was sure someone had paved the ground before me in this regard, and I was right. Big-head Giada De Laurentiis to the rescue!! (Ok, she’s pretty and all and I like her food…but does she have an unusually large head or what?! It’s like a bobble head.) But then Ina spoke up…she had a recipe that was far more decadent and involved heavy cream, more eggs, and cooking it in a bain-marie, or a water bath essentially. Bain-marie is a French term for a piece of equipment used to heat materials gently and gradually to fixed temperatures, or to keep materials warm over a period of time. And if I followed that method, my cooking street cred would go up like A THOUSAND points right?! So I settled on Ina’s recipe. 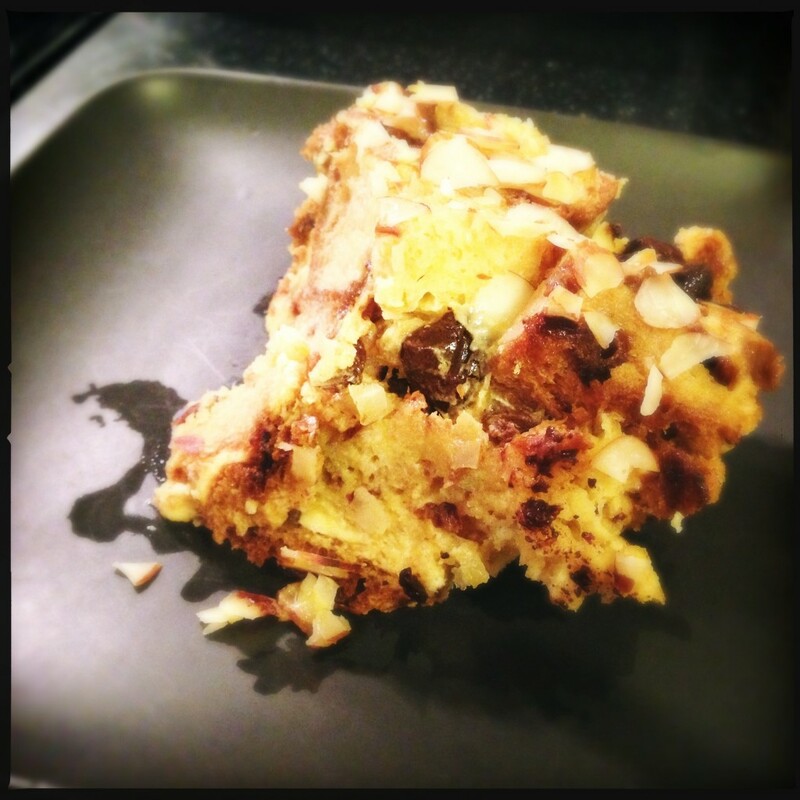 Panettone mixed with custard, sprinkled with chocolate chips, and topped with almonds. II got to work on Christmas morning after shaking off a bit of sluggishness that potentially may or may not have come from one too many Christmas Eve Manhattans. Just sayin. Cube the panettone, toast in the oven at 350, put in buttered pan, toss in some chocolate chips (not in Giada or Ina’s recipe, but what the heck!) pour the custard over, and cook. And cook….45 minutes covered, and then another 45 minutes uncovered! Ooof… Well worth the results though! 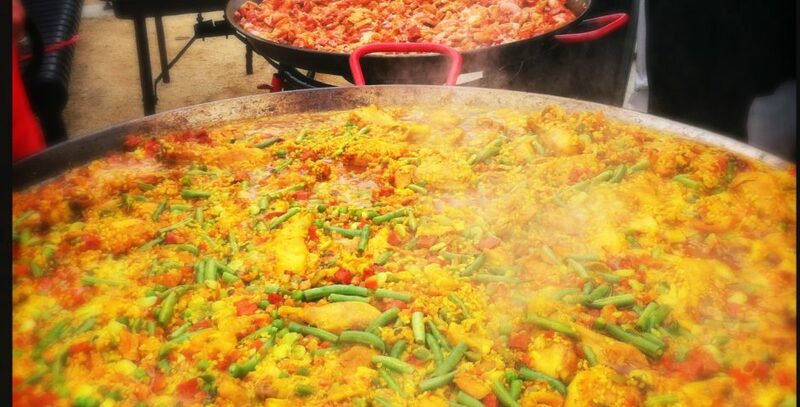 In fact…it’s so good I think I’m going to go have some leftovers. 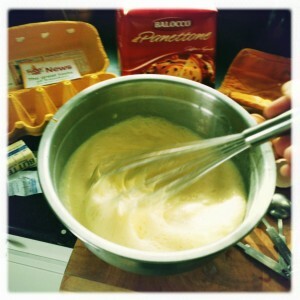 Some recipes call for an Amaretto sauce, but we opted to not have it. Ok, that decision was assisted by the fact the one grocery store I stopped at on the way to Christmas dinner did not even have Amaretto in the store. Grrr. But I think it was fortuitous, as it’s already pretty sweet. I mean, just look at the picture below. Happy tummy!! Place the baking dish into a larger pan and add very hot tap water to the larger pan until it’s halfway up the side of the baking dish. Cover the larger pan with aluminum foil, tenting the foil so it doesn’t touch the pudding. Cut a few holes in the foil to allow steam to escape. Bake the pudding for 45 minutes. Uncover and bake for 40 to 45 more minutes, until the custard is set and the top of the pudding is light golden brown. Allow to cool for 15 minutes. Serve warm or at room temperature. 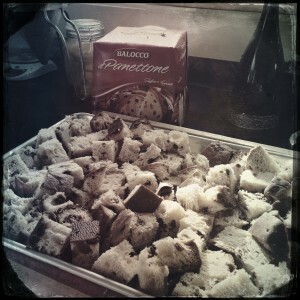 This entry was posted in Desserts and tagged bread pudding, dessert, Italian, Panettone. Bookmark the permalink.